In May 2013, Turkish protests erupted in Istanbul's Taksim Gezi Park in response to plans to replace the park with a shopping mall. They quickly turned nationwide and broadened to issues like freedom of assembly, freedom of expression, secularism, media blackouts, capitalism and globalization. The photograph is from an Izmir event held in response to the cutting of the Middle East Technical University forest to build an inter-province highway. The early days Gezi Protests were nonviolent, but after a harsh response by the police, violence and vandalism by the protestors were reported. 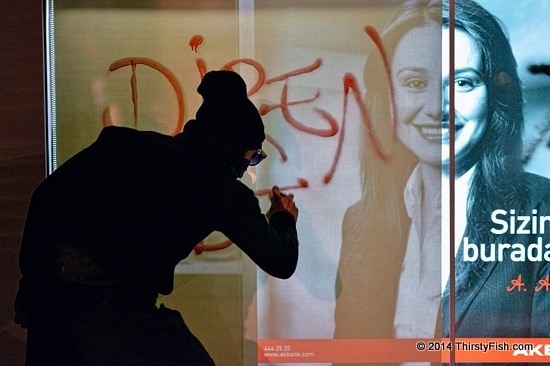 Some anarchists, such as the one pictured above, used black bloc tactics like vandalizing bank windows. An earlier post investigated the use (or rather misuse) of black block tactics in Occupy protests. These tactics can have a place in protests as a part of a greater and targeted strategy, but vandalizing local businesses or jumping on passing cars, only serve to undermine movements powered by popular sympathy - as it did in the Occupy Movement. Randomly breaking windows does not better anything. On the other hand, self-defense and "resistance" to wrongdoing are not only justified, but a duty. If you are protesting banks, the targeted disruption of bank operations might accomplish something, but exposing corruption and then building a movement to prosecute bankers is golden. That is what Icelanders did. Resist, but be smart.